Middle market companies are leading job growth, employing more than 50 million people and making a contribution of nearly $6.2 trillion to the U.S. economy, according to the inaugural Middle Market Power Index from American Express (NYSE: AXP) and Dun & Bradstreet (NYSE: DNB). Using Dun & Bradstreet’s proprietary databases of commercially-active1 U.S. firms, the report analyzes the characteristics and economic impact of middle market enterprises—defined as businesses generating between $10 million and $1 billion in revenues. This first in a series of Middle Market Power Index reports from American Express and Dun & Bradstreet analyzes the state of middle market companies and finds that while these companies comprise less than 1% of U.S. businesses, they make an outsized economic contribution across industries. Slightly more than one in five dollars (21%) of U.S. business revenues come from the middle market, and these firms employ over one in four workers (28%) in the private sector. Middle market companies have led job growth since 2008, with a 4.4% increase in private sector employment—outperforming both smaller businesses (less than $10 million in revenues) and the largest companies (more than $1 billion in revenues). While small firms employ the largest share of the country’s workforce, the report finds the middle market created 2.1 million (92%) of the nearly 2.3 million net new jobs added during the past seven years. While the majority of large firms are publicly-traded (57%), nearly 98% of middle market enterprises are privately-owned. On average, middle market businesses employ 368 workers and generate $45.1 million per firm per year, compared to 23,226 employees and $7.7 billion among larger enterprises and an average of 4 employees and nearly $276,000 among small companies. The report also finds that middle market firms operate in all industries, with the largest concentration in the service sector (34%). Within the service sector, business services (12%) lead among middle market companies, followed by educational services (8%) and health services (7%). Looking beyond the service sector, the data finds the next largest industries for middle market firms are wholesale or retail trade (25%), manufacturing (17%), and construction (8%). Compared to small or large enterprises, more middle market firms are concentrated in wholesale trade. 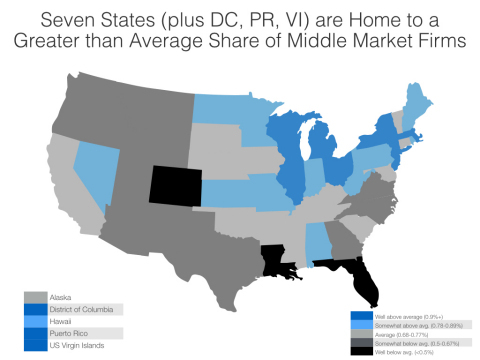 In addition to these seven states, higher than average percentages of middle market firms exist in Washington, D.C. (1.8%), Puerto Rico (5.1%), and the U.S. Virgin Islands (3.9%). Among commercially-active firms in the U.S., 7% are identified as majority women-owned while 2% are majority minority-owned. Women own 7% of commercially-active, privately-owned small businesses, 6% of middle market companies, and just 1% of large enterprises. Additionally, 2% of commercially-active small businesses are minority-owned, as are 5% of middle market companies and 1% of large firms. 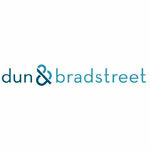 American Express and Dun & Bradstreet will release subsequent reports in the coming months, which will feature other areas of opportunity unique to middle market firms. 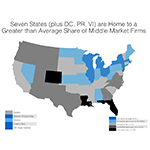 To read the full Middle Market Power Index, click here. The Middle Market Power Index report is based on an analysis of all of the firms in Dun & Bradstreet’s commercial databases of nearly 19 million (18,950,877) businesses between 2008 and 2014: the first a virtual census of all of the commercially-active businesses in the United States (defined as firms that have obtained a D-U-N-S® number and that sell and receive goods and services and utilize credit transactions in their business); the second their credit scoring archive database, which collects and models business commercial activity and business financial strength. All subsidiary and business establishment data are combined; only enterprise-level data (top of the business family tree, or Ultimate D-U-N-S® number firms) are reported. Additionally, public sector entities are excluded. 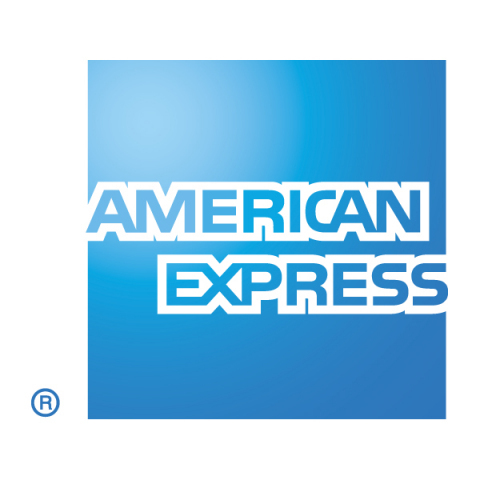 Through its Global Corporate Payments division, American Express offers a suite of B2B and T&E payment solutions that help organizations streamline processes and transform them into opportunities for savings, control and efficiency. American Express can help your organization increase working capital flexibility and strengthen relationships with suppliers. 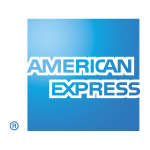 For more information, visit us at business.americanexpress.com/us and linkedin.com/company/american-express-global-corporate-payments.